The consorts of the five Dhyani Buddhas represent and purify elements in ourselves and our environment. The blue mother Vajravarahi purifies space. The white mother Lochana purifies water. The yellow mother Mamaki purifies earth. The red mother Pandaravasini purifies fire. The green mother Samayatara purifies air. 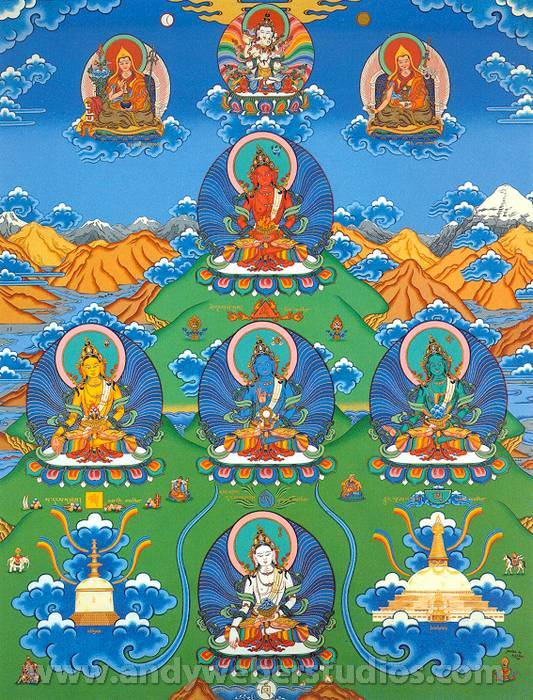 In the top centre sits Heruka Vajrasattva, flanked by two lineage holders H.H. Trijang Rimpoche (left) and H.H. Song Rimpoche (right). In the bottom corners are two of the great stupas, on the right the stupa of Boudhanath (Nepal) and on the left the stupa of Oddiyana (the ancient kingdom now in north Pakistan) which is partly destroyed.